Liu Xiaobo and his writing will live long beyond his death. Read by Salman Rushdie, Seamus Heaney, Ariel Dorfman, Mark Kilroy and Adam Shapiro. No Enemies spearheads a campaign by Front Line Defenders and PEN International demanding the release of imprisoned Chinese human rights defender Liu Xiaobo and his wife Liu Xia, who is under house arrest. The campaign is part of a larger international effort to secure the freedom of the 2010 Nobel Peace Prize winner and has as its centre a petition which has been signed by nearly half a million people all over the world. 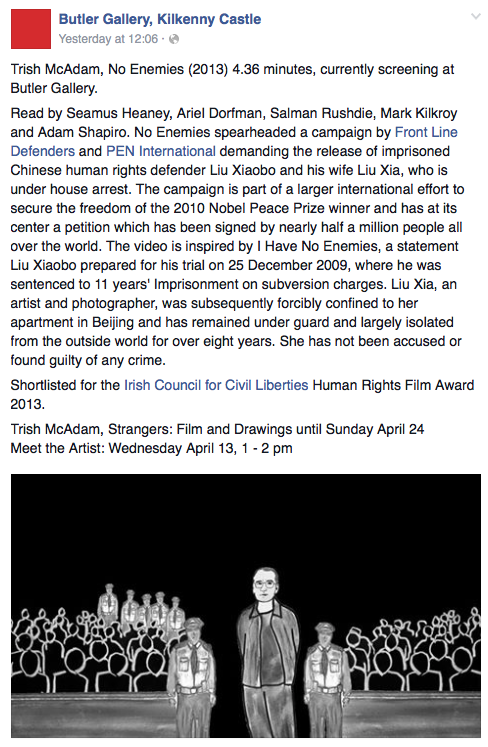 The video is inspired by I Have No Enemies, a statement Liu Xiaobo prepared for his trial on 25 December 2009, where he was sentenced to 11 years' imprisonment on subversion charges. His wife, an artist and photographer, was subsequently forcibly confined to her apartment in Beijing and has remained under guard and largely isolated from the outside world for over two years. She has not been accused – or found guilty – of any crime. Front Line Defenders urges you to watch this video and absorb the deeply moving words of this remarkable individual, who despite years of suffering, remains unbowed yet free of hate, steeled by the love of his wife. Log on to www.lighthonestyhrd.org, sign the petition and join with thousands of others demanding the release of Liu Xiaobo and Liu Xia.